Back pain is a common ailment that affects individuals of all ages and may result from conditions including, but not limited to, injury, obesity, age, disc disease, spinal stenosis, spinal sprains and strains. Back pain treatments include short-term rest, nonsteroidal anti-inflammatory drugs, muscle relaxants, back braces/spinal orthotics and passive modalities such as heat, cold, massage, ultrasound, electrical stimulation, acupuncture, traction, and spinal manipulation. More invasive treatments may involve anesthetic injections and surgery. Orthotic devices are orthopedic appliances or apparatuses used to support, align, prevent or correct deformities. A brace is an orthosis or orthopedic appliance that supports or holds in correct position any movable part of the body and that allows for motion of that body part. A spinal orthosis provides an external force to control spine position, applies corrective forces to abnormal curvatures, provides stabilization of spine structures when soft tissue can’t, and restricts spine movement after trauma. The biomechanics typically consist of a three-point pressure system directed at trunk and head support, motion control, spinal realignment and partial weight transfer when upright. Spinal orthoses include cervical orthoses (CO), cervical-thoracic orthoses, (CTO), thoracic orthoses (TO), thoracic-lumbar-sacral orthoses, (TLSO), lumbar-sacral orthoses (LSO), and lumbar orthoses (LO). Spinal orthoses have been recommended for conservative treatment of back pain and to stabilize the spine. Conditions for which spinal orthoses have been recommended for relieving pain, reducing progression of disease/injury, and improving function include but are not limited to spinal stenosis, vertebral fractures, scoliosis, spondylosis, spondylolisthesis, Scheuermann’s disease (kyphotic deformity), and sprains. The short-term use of a rigid lumbar support (i.e., 1–3 weeks) is recommended as a treatment for low-back pain of relatively short duration (i.e., < six months). The use of a lumbar brace for patients with chronic low-back pain is not recommended because there is no pertinent medical evidence of any long-term benefit or evidence that brace therapy is effective in the treatment of patients with chronic (i.e., > six months) low-back pain. Lumbar braces are not recommended as a means of decreasing low-back pain in the general working population; however, they are recommended as a means of decreasing the number of sick days lost due to low-back pain among workers with a previous lumbar injury. The use of lumbar brace therapy as a preoperative diagnostic tool or transpedicular external fixation to predict outcome following lumbar fusion surgery is not recommended. Combined with education and training on back mechanics and lifting, elastic rib belts and lumbar supports have been recommended for the prevention of injury in the workplace. Corsets, a type of spinal brace commonly used to treat low back pain. If you'd like to read a comprehensive article about all types of spinal bracing, please read our spinal bracing overview. What Does a Corset Brace Look Like? A corset brace is fairly easy to visualize. It looks similar to the corsets women wore centuries ago. Corset braces are tightened using laces that can be tied in the back, front, or side. In most cases, these braces are made of cotton or nylon. And unlike its fashionable counterpart, corset braces are actually quite comfortable. Corset braces are held up with straps that go over the shoulder. From the front, the corset usually covers the area from the sternum down to the pelvic area. From the back, it covers from the shoulder down to below the buttocks. How Does a Corset Brace Work? Corsets work by increasing the pressure in the abdomen, thus reducing the amount of weight placed on sensitive spinal structures, such as vertebrae and joints. By reducing the stress on these structures, it creates an environment that allows your spine to heal faster. Though the corset brace is made of lightweight cloth, it may contain metal bars that provide rigid reinforcements to prevent movement and help improve posture. These bars may be added or removed based on your specific treatment needs. For instance, if you need a brace to help you recover from lumbar spine surgery, the metal bars will restrict movement and allow the sensitive surgical area to heal easier. As with all spinal braces, the effectiveness of a corset brace is dependent on how well it has been tailored to you. In other words, bracing isn't a one-size-fits-all treatment. It's essential that your brace fits you properly. Fortunately, there are specialists known as orthotists who will ensure that your corset brace is created just for you. There's also no standard length of time that you will wear the brace. How long you'll wear the corset brace varies among patients, so always follow your doctor's specific instructions. He or she will show you how to care for the brace and make specific recommendations to maximize the effectiveness of the treatment. Hyperextension braces are commonly used to treat spinal compression fractures and help your back recover after spine surgery. This article will focus on hyperextension braces, though there are many other types of spinal braces (which your doctor may call orthotics or orthoses). To read a general bracing treatment article that describes all spinal bracing options, please read our spinal bracing overview. What Does a Hyperextension Brace Look Like? Hyperextension braces are used to treat fractures and back pain that occur where the thoracic spine (upper back) meets the lumbar spine (low back). It is designed to limit movement in these 2 regions of the spine. To limit front bending, a hyperextension brace features a rectangular metal frame that goes over the front of the body. This frame puts pressure on the chest and pubic bone. Because a hyperextension brace is primarily used to treat spinal compression fractures that occur where the upper back meets the low back, this brace also puts pressure and support on the thoracic spine. This pressure keeps the spine in an extended position. A hyperextension brace also features 3 pads that help stabilize the spine and prevent forward movement. One pad is located along the abdominals, another is higher up on the chest, and the third pad is on the back and covers the affected area. How Does a Hyperextension Brace Work? Hyperextension braces prevent you from bending forward too much. In turn, this prevents you from potentially interfering with the healing of your spinal compression fracture and sensitive spinal structures. This type of spinal brace may also be prescribed if you've just had spine surgery involving the thoracic or upper lumbar region of the spine. A hyperextension brace will take the pressure off of weak vertebrae and ensure that you don't bend too far forward. Though hyperextension braces restrict bending of the spine, you may still bend to the side and rotate. If you are recovering from spinal compression fractures or spinal surgery, your doctor may recommend adding a hyperextension brace to your treatment plan. You will visit with an orthotist, a specialist who designs spinal braces. He or she will make sure that your hyperextension brace fits you properly, which is vital to the effectiveness of the brace. Bracing is a very personal treatment option. In other words, there are few general guidelines when it comes to using a brace. That's why it's so important that you follow your doctor's specific instructions for you. A molded jacket, also called a thoracolumbosacral orthosis (TLSO), provides rigid stabilization to treat a number of spinal conditions, including spinal fractures and scoliosis. This article is specifically about molded jackets. If you'd like to learn about all the different types of spinal braces, please read our spinal bracing overview. A molded jacket is a total-coverage brace. What that means is that this spinal brace supports a large area—it covers the thoracic spine (upper back), lumbar spine (low back), and sacrum. Your doctor may also prescribe a molded jacket to limit movement and promote healing after spine surgery. What Does a Molded Jacket Look Like? A molded jacket is made of a hard, lightweight plastic shell with a soft inner lining for comfort. Some molded jackets are single-piece braces that come with one opening. Others come in 2 pieces with openings on both sides of the jacket (this design is often called the clamshell). As the name implies, a molded jacket is molded to your body. A specialist called an orthotist will specially design and custom fit the molded jacket for you. To customize the fit, your orthotist will likely use digital technology to accurately craft the mold for your brace. Plaster of Paris may also be used to create a cast, though this method is more outdated. How Does a Molded Jacket Work? A molded jacket controls movement in all directions—front, back, and side. It also limits how far you can rotate. By restricting mobility, a molded jacket prevents further damage to spinal structures that are trying to heal. The rigidity of the brace may also prevent the progression of deformity in patients with scoliosis or kyphosis. A molded brace also encourages healing by increasing pressure in your abdomen and chest. This, in turn, reduces the pressure on your spine. Molded jackets can provide non-surgical treatment for a variety of spinal disorders. But as with any treatment, it's essential that you follow your doctor's specific instructions. Patients typically wear a molded jacket for 3 months, but your doctor may recommend a different length of wear for you based on your condition. If you have any questions about how to care for your spinal brace—or if you'd like more information on how your brace may improve your condition—don't hesitate to ask your doctor or orthotist. If you require cervical spine surgery, or if you've experienced trauma or injury to your neck, you may need to wear a neck brace. Neck braces are among the most common of all spinal braces (which your doctor may call orthoses or orthotics). There are many kinds of neck braces, and the most common ones are outlined below. If you'd like to read a general article that describes all the types of spinal braces, please read our spinal bracing overview. Neck braces, which are also called collars, serve a variety of purposes. They can stabilize your neck after cervical spine surgery, or they can provide non-surgical relief if you've experienced trauma or injury to your neck (from whiplash, for instance). Soft collars are flexible and made of polyurethane foam rubber. These collars are easily wrapped around the neck and secured with Velcro. Soft collars are usually worn after wearing a more rigid collar, so most of the healing will be complete by the time you begin wearing a soft collar. The main purpose of a soft collar is to help you gradually transition to not wearing a brace. Hard collars look similar to soft collars, but they are made of a hard polyethylene material. These collars may provide support and pain relief for a variety of spinal conditions, including cervical spondylosis and acute neck pain. A Philadelphia collar is a stiff foam collar composed of 2 pieces that are attached on the sides with Velcro. The upper portion of the Philadelphia collar supports the lower jaw and the brace extends down to cover the upper thoracic spine. This collar covers more area than a soft or hard collar, so it puts greater restrictions on your range of motion. Because it's so effective at limiting movement, the Philadelphia collar is often prescribed after cervical spine surgery to promote a healthy recovery. It's also commonly used to stabilize minor cervical spinal fractures and reduce pain associated with muscle strain in the neck. A sterno-occipital-mandibular immobilization device (SOMI) is a rigid cervical brace that positions your neck in straight alignment with your spine. This brace supports your neck by preventing your head and neck from moving. This level of immobility will allow the damaged structures in your neck to heal faster. The name of this brace gives an indication of its structure. Sterno comes from sternum, which is in your chest. This rigid brace has a front chest plate, along with bars that go over the shoulder. The brace is secured with straps on the bars that attach to opposite sides of the front chest plate. There are no bars that go along your back. The SOMI brace also has a removable chin piece (mandibular comes from mandible, which is your lower jawbone) and optional headpiece for added support (occipital refers to the occipital bone at the back of your head). The SOMI brace may be used as a treatment for a severe neck injury or for cervical pain caused by a chronic condition, such as rheumatoid arthritis. It may also be prescribed as a recovery aid after cervical spine surgery. A halo device is the most rigid of all neck braces. It prevents the head and neck from moving, and it may be necessary to immobilize the spine after a major cervical spine procedure or to stabilize fractures in the cervical and/or thoracic regions. Halo bracing is a form of spinal traction. Traction essentially pulls your spine in two different directions. This tension helps reduce the abnormal curvature associated with some spinal conditions, including scoliosis. A halo brace features a metal ring that is secured to your head using metal pins. The ring is then connected to 4 bars that are attached to a heavy vest (the weights of halo vests vary). You will wear the halo brace at all times until you are healed. If you'd like to learn more, please read our article about halo bracing. Like all spinal braces, neck braces are most effective when you use them as directed by your doctor. You will also work with an orthotist, a specialist who designs and custom fits spinal braces. If you have any questions about how to wear and care for your brace, don't hesitate to ask your doctor or orthotist. He or she is there to ensure that you understand how to get the most benefit from your treatment. Rigid braces may be used to treat low back pain. They are also commonly prescribed to stabilize your lumbar spine after surgery. There are many types of spinal braces (which your doctor may call orthotics or orthoses), and this article will describe rigid braces. If you'd like to read a more general article about all the types of spinal braces, please read our spinal bracing overview. There are many different types of rigid braces available, but they share a common structure. They usually have metal or plastic uprights (vertical posts) in the back that mirror the shape of your low back and pelvis. Rigid braces also have bands that lay across your thoracic spine (or upper back). To help transfer weight off your spine, these braces feature fabric straps that place pressure on the abdomen. A chairback brace is a short brace that may provide low back pain relief and spinal stability after surgery. This brace restricts your ability to bend (front, back, and to the sides) and limits how much your low back can rotate. The Raney flexion jacket reduces pressure and weight on the low back by securing the lumbar spine in a neutral tilt. This creates more pressure in the abdomen, which lessens the weight on the low back. The fixed tilt also helps prevent the progression of lordosis. Lordosis is a condition characterized by an abnormal, inward curve of the lumbar spine. The Williams brace is commonly prescribed to limit movement in patients with spondylolysis or spondylolisthesis. This rigid brace has a front elastic band, so you can bend forward, but side uprights limit how much you can bend from side-to-side. The Williams brace also limits extension. Regardless what rigid brace you need, your brace will be custom fit by an orthotist (a specialist who designs and fits braces). Ensuring that your brace fits you perfectly is so important. Also important is that you follow your doctor's specific instructions for the wear and care of your spinal brace. If you're unsure about any aspect of your bracing treatment, call your doctor and/or orthotist. Sacroiliac and lumbosacral belts are back braces that help treat pain in the lumbar spine and sacrum. There are spinal braces (which your doctor may call orthotics or orthoses) for every region of the spine, but this article will focus solely on sacroiliac and lumbosacral belts. To read a comprehensive article about all the different types of spinal braces, please read our spinal bracing overview. Your doctor may prescribe a sacroiliac belt if you have sacroiliac joint pain. The sacroiliac joints, which are often called SI joints, are located on both sides of your sacrum (the base of your spine). Your SI joints connect the sacrum to the pelvis, and we have a video on the sacroiliac joints to help you learn more. Like all joints, the sacroiliac joints are encased in strong ligaments. Healthy ligaments prevent the SI joints from moving too much. But if the ligaments become diseased (from osteoarthritis, for instance), injured, or worn down by age, they allow the SI joints to move more than they should. This can cause pain in your pelvis and low back. A condition called sacroiliac joint dysfunction can also cause low back pain. 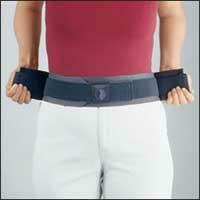 A sacroiliac belt provides compression around the hip to prevent the SI joints from moving excessively. The belt is wrapped around the pelvis and may be tightened using laces on the side or back of the brace. Lumbosacral belts are designed to provide pressure on your abdominals, thereby reducing weight and stress on your low back. This type of brace provides lumbar spine stabilization, so it creates an optimal healing environment for a number of lumbar spine conditions, including low back muscle strain. Made of sturdy cotton, lumbosacral belts are wrapped around your waist and can be easily adjusted using laces on the side or back. Lumbosacral belts are available in a variety of sizes to provide the right amount of support for different low back conditions. It's essential that you follow your doctor's specific instructions for the wear and care of your spinal brace. Whether you need a lumbosacral belt or sacroiliac belt for your low back pain, you should understand that the brace is most effective when you wear it according to your doctor's orders. You may also consult with your orthotist if you have any questions. He or she specializes in the design and fit of spinal braces, so don't hesitate to contact your orthotist if you're unsure about any aspect of your bracing treatment. A trochanteric belt, like a sacroiliac belt, is a spinal brace that helps treat sacroiliac joint pain. Spinal braces are also called orthotics or orthoses, and there are different bracing types that treat a number of spinal conditions. What Does a Trochanteric Belt Look Like? A trochanteric belt is similar to a regular belt in that it buckles in front. Unlike regular belts, you wear the trochanteric belt underneath your garments. Fortunately, this brace is not bulky; it's discreet and comfortable. The trochanteric belt is about 3 inches wide and fits snuggly around your pelvis. Specifically, it's placed between the trochanters (bony structures located at the top of the thigh bone) and the iliac crests (the outside portion of each side of the pelvis). How Does a Trochanteric Belt Work? Trochanteric belts compress and stabilize painful sacroiliac joints. The sacroiliac joints (SI joints) are located on both sides of your sacrum (the base of your spine). Your SI joints connect the sacrum to the pelvis. This video on the sacroiliac joints will help you learn more about these structures. The sacroiliac joints are protected by strong ligaments. Healthy ligaments ensure that the SI joints don't move very much. But if the ligaments become diseased, injured, or worn down by age, then the SI joints will move more than they should. This can cause pain in your pelvis and low back. A trochanteric belt may not only reduce sacroiliac joint and low back pain, but it may also help stabilize pelvic fractures. By restricting movement in the area, the brace allows the fractures to heal properly. As with any spinal brace, the effectiveness of the trochanteric belt is largely dependent on whether you follow your doctor's specific instructions for you. Bracing is a very personal spinal treatment in that there's no one-size-fits-all prescription. Your doctor and orthotist (a specialist who designs and fits braces) will work together to ensure that your bracing treatment is customized to give you the best results possible. TLSO, triplanar control, rigid posterior frame and flexible soft anterior apron with straps, closures and padding, extends from sacrococcygeal junction to scapula, lateral strength provided by pelvic, thoracic, and lateral frame pieces, rotational strength provided by subclavicular extensions, restricts gross trunk motion in sagittal, coronal, and transverse planes, produces intracavitary pressure to reduce load on the intervertebral disks, includes fitting and shaping the frame, prefabricated, includes fitting and adjustment. TLSO, triplanar control, hyperextension, rigid anterior and lateral frame extends from symphysis pubis to sternal notch with two anterior components (one pubic and one sternal), posterior and lateral pads with straps and closures, limits spinal flexion, restricts gross trunk motion in sagittal, coronal, and transverse planes, includes fitting and shaping the frame, prefabricated, includes fitting and adjustment. TLSO, triplanar control, one piece rigid plastic shell with interface liner, multiple straps and closures, posterior extends from sacrococcygeal junction and terminates just inferior to scapular spine, anterior extends from symphysis pubis to sternal notch, anterior or posterior opening, restricts gross trunk motion in sagittal, coronal, and transverse planes, includes a carved plaster or CAD-CAM model, custom fabricated. TLSO, triplanar control, two piece rigid plastic shell without interface liner, with multiple straps and closures, posterior extends from sacrococcygeal junction and terminates just inferior to scapular spine, anterior extends from symphysis pubis to sternal notch, lateral strength is enhanced by overlapping plastic, restricts gross trunk motion in the sagittal, coronal, and transverse planes, includes a carved plaster or CAD-CAM model, custom fabricated. TLSO, triplanar control, two piece rigid plastic shell with interface liner, multiple straps and closures, posterior extends from sacrococcygeal junction and terminates just inferior to scapular spine, anterior extends from symphysis pubis to sternal notch, lateral strength is enhanced by overlapping plastic, restricts gross trunk motion in the sagittal, coronal, and transverse planes, includes a carved plaster or CAD-CAM model, custom fabricated. TLSO, triplanar control, one piece rigid plastic shell with interface liner, multiple straps and closures, posterior extends from sacrococcygeal junction and terminates just inferior to scapular spine, anterior extends from symphysis pubis to sternal notch, anterior or posterior opening, restricts gross trunk motion in sagittal, coronal, and transverse planes, prefabricated, includes fitting and adjustment. TLSO, sagittal-coronal control, one piece rigid plastic shell, with overlapping reinforced anterior, with multiple straps and closures, posterior extends from sacrococcygeal junction and terminates at or before the T9 vertebra, anterior extends from symphysis pubis to xiphoid, anterior opening, restricts gross trunk motion in sagittal and coronal planes, prefabricated, includes fitting and adjustment. TLSO, sagittal-coronal control, modular segmented spinal system, two rigid plastic shells, posterior extends from the sacrococcygeal junction and terminates just inferior to the scapular spine, anterior extends from the symphysis pubis to the xiphoid, soft liner, restricts gross trunk motion in the sagittal and coronal planes, lateral strength is provided by overlapping plastic and stabilizing closures, includes straps and closures, prefabricated, includes fitting and adjustment. TLSO, sagittal-coronal control, modular segmented spinal system, three rigid plastic shells, posterior extends from the sacrococcygeal junction and terminates just inferior to the scapular spine, anterior extends from the symphysis pubis to the xiphoid, soft liner, restricts gross trunk motion in the sagittal and coronal planes, lateral strength is provided by overlapping plastic and stabilizing closures, includes straps and closures, prefabricated, includes fitting and adjustment. Sacroiliac orthosis, flexible, provides pelvic-sacral support, reduces motion about the sacroiliac joint, includes straps, closures, may include pendulous abdomen design, prefabricated,includes fitting and adjustment. Sacroiliac orthosis, flexible, provides pelvic-sacral support, reduces motion about the sacroiliac joint, includes straps, closures, may include pendulous abdomen design, custom fabricated. Sacroiliac orthosis, provides pelvic-sacral support, with rigid or semi-rigid panels over the sacrum and abdomen, reduces motion about the sacroiliac joint, includes straps, closures, may include pendulous abdomen design, prefabricated, includes fitting and adjustment. Sacroiliac orthosis, provides pelvic-sacral support, with rigid or semi-rigid panels placed over the sacrum and abdomen, reduces motion about the sacroiliac joint, includes straps, closures, may include pendulous abdomen design, custom fabricated. Lumbar orthosis, flexible, provides lumbar support, posterior extends from L-1 to below L-5 vertebra, produces intracavitary pressure to reduce load on the intervertebral discs, includes straps, closures, may include pendulous abdomen design, shoulder straps, stays, prefabricated, includes fitting and adjustment. Lumbar orthosis, sagittal control, with rigid posterior panel(s), posterior extends from L-1 to below L-5 vertebra, produces intracavitary pressure to reduce load on the intervertebral discs, includes straps, closures, may include padding, stays, shoulder straps, pendulous abdomen design, prefabricated, includes fitting and adjustment. Lumbar orthosis, sagittal control, with rigid anterior and posterior panels, posterior extends from L-1 to below L-5 vertebra, produces intracavitary pressure to reduce load on the intervertebral discs, includes straps, closures, may include padding, shoulder straps, pendulous abdomen design, prefabricated, includes fitting and adjustment. LSO, flexible, provides lumbo-sacral support, posterior extends from sacrococcygeal junction to T-9 vertebra, produces intracavitary pressure to reduce load on the intervertebral discs, includes straps, closures, may include stays, shoulder straps, pendulous abdomen design, prefabricated, includes fitting and adjustment. LSO,flexible, provides lumbo-sacral support, posterior extends from sacrococcygeal junction to T-9 vertebra, produces intracavitary pressure to reduce load on the intervertebral discs, includes straps, closures, may include stays, shoulder straps, pendulous abdomen design, custom fabricated. LSO, sagittal control, with rigid posterior panel(s), posterior extends from sacrococcygeal junction to T-9 vertebra, produces intracavitary pressure to reduce load on the intervertebral discs, includes straps, closures, may include padding, stays, shoulder straps, pendulous abdomen design, prefabricated, includes fitting and adjustment. LSO, sagittal control, with rigid anterior and posterior panels, posterior extends from sacrococcygeal junction to T-9 vertebra, produces intracavitary pressure to reduce load on the intervertebral discs, includes straps, closures, may include padding, shoulder straps, pendulous abdomen design, custom fabricated. LSO, sagittal-coronal control, with rigid posterior frame/panel(s), posterior extends from sacrococcygeal junction to T-9 vertebra, lateral strength provided by rigid lateral frame/panels, produces intracavitary pressure to reduce load on intervertebral discs, includes straps, closures, may include padding, stays, shoulder straps, pendulous abdomen design, prefabricated, includes fitting and adjustment. LSO, sagittal-coronal control, with rigid posterior frame/panel(s), posterior extends from sacrococcygeal junction to T-9 vertebra, lateral strength provided by rigid lateral frame/panel(s), produces intracavitary pressure to reduce load on intervertebral discs, includes straps, closures, may include padding, stays, shoulder straps, pendulous abdomen design, custom fabricated. LSO, sagittal-coronal control, lumbar flexion, rigid posterior frame/panel(s), lateral articulating design to flex the lumbar spine, posterior extends from sacrococcygeal junction to T-9 vertebra, lateral strength provided by rigid lateral frame/panel(s), produces intracavitary pressure to reduce load on intervertebral discs, includes straps, closures, may include padding, anterior panel, pendulous abdomen design, prefabricated, includes fitting and adjustment. LSO, sagittal-coronal control, lumbar flexion, rigid posterior frame/panels, lateral articulating design to flex the lumbar spine, posterior extends from sacrococcygeal junction to T-9 vertebra, lateral strength provided by rigid lateral frame/panels, produces intracavitary pressure to reduce load on intervertebral discs, includes straps, closures, may include padding, anterior panel, pendulous abdomen design, custom fabricated. LSO, sagittal-coronal control, with rigid anterior and posterior frame/panels, posterior extends from sacrococcygeal junction to T-9 vertebra, lateral strength provided by rigid lateral frame/panels, produces intracavitary pressure to reduce load on intervertebral discs, includes straps, closures, may include padding, shoulder straps, pendulous abdomen design, prefabricated, includes fitting and adjustment. LSO, sagittal-coronal control, with rigid anterior and posterior frame/panels, posterior extends from sacrococcygeal junction to T-9 vertebra, lateral strength provided by rigid lateral frame/panels, produces intracavitary pressure to reduce load on intervertebral discs, includes straps, closures, may include padding, shoulder straps, pendulous abdomen design, custom fabricated. LSO, sagittal-coronal control, rigid shell(s)/panel(s), posterior extends from sacrococcygeal junction to T-9 vertebra, anterior extends from symphysis pubis to xyphoid, produces intracavitary pressure to reduce load on the intervertebral discs, overall strength is provided by overlapping rigid material and stabilizing closures, includes straps, closures, may include soft interface, pendulous abdomen design, prefabricated, includes fitting and adjustment. LSO, sagittal-coronal control, rigid shell(s)/panel(s), posterior extends from sacrococcygeal junction to T-9 vertebra, anterior extends from symphysis pubis to xyphoid, produces intracavitary pressure to reduce load on the intervertebral discs, overall strength is provided by overlapping rigid material and stabilizing closures, includes straps, closures, may include soft interface, pendulous abdomen design, custom fabricated.